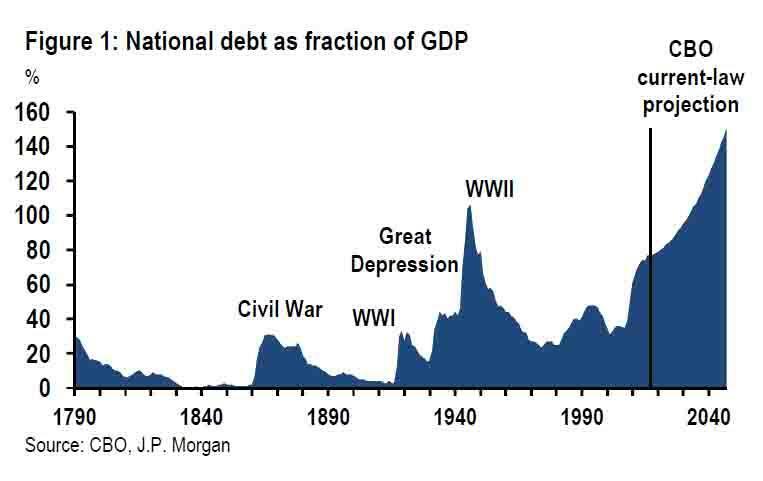 The reason for the soaring debt total is, of course, the runaway US budget deficit, which while providing a temporary sugar rush to the US economy comes at a cost of explosive debt. As a reminder, one month ago, the CBO revised its forecast, and now expects the deficit will approach $1 trillion by the end of this fiscal year or one year sooner than disclosed in the CBO's most recent forecast; in April the agency didn’t expect the deficit to reach $1 trillion until 2020. In both parties, deficit spenders are gaining ground. That makes Year Two of the Trump administration look increasingly like end-times if you are, for example, the Committee for a Responsible Federal Budget. “The tax cuts really set off a spiral of irresponsible justifications for not caring about fiscal responsibility,’’ says Maya MacGuineas, president of the CRFB. The group gets funding from the Peter G. Peterson Foundation, a project of the late Wall Street billionaire, who advocated slashing social programs to balance the budget. One reason why US legislators no longer care about either the deficit or US Federal Debt may be because deficits are supposed to trigger inflation and scare off bond investors. And while until recently, the latter have been all but missing, a sharp repricing took place last week when as we discussed previously, 10Y yields soared in the last three days of the past week amid a vicious repricing of inflationary expectations, which led to a near record bond market rout, a surge in bond market volatility and a sharp selloff in stocks. As the market's attention gradually turns to rising rates and interest expense, one number that will stick out is the following: in 2018 the amount spent on interest on US federal debt hit a record high of just over $523 billion. Another problem is that this rate is artificially low as it reflects historical funding cost as the average 10Y yield for all of 2017 was close to 2.3%. Compare that to current yield of 3.23%, which is already 39% higher. With sharp rate moves higher across the curve, every incremental auction which will roll over debt into a much higher cash interest expense. 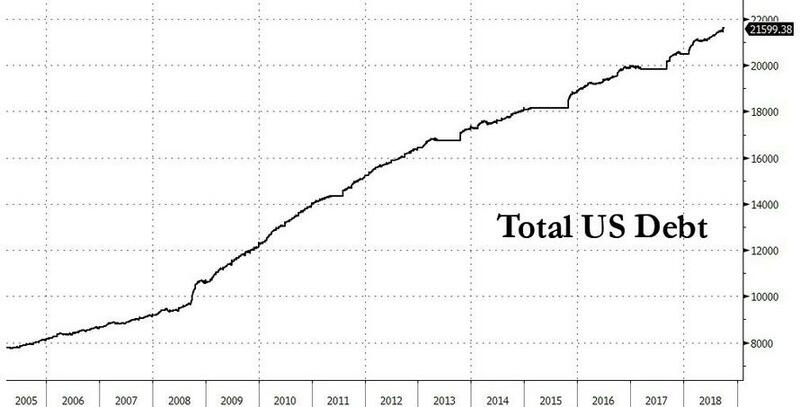 And that assumes no incremental supply, which of course is false: already the US Treasury plans to borrow $770 billion in the second half of 2018, a 60% increase from the same period last year. 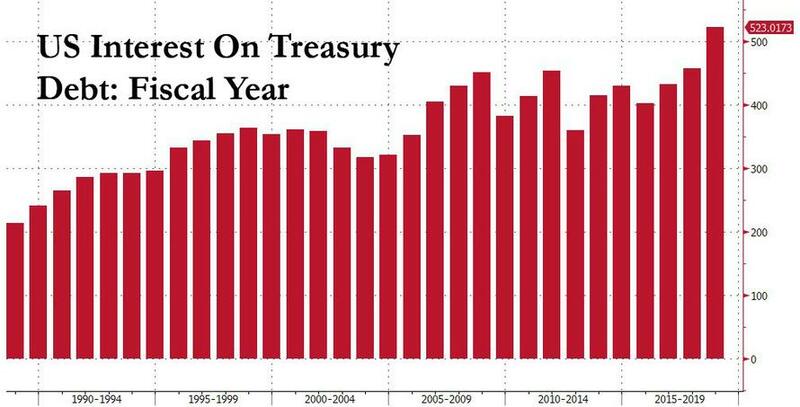 The net impact, as IFR notes, is "dramatic": BlackRock estimates that the net supply of Treasury securities will more than double this year, to over $900 billion, and rise to nearly $1.2 trillion in 2019. The market hasn’t had to digest that much government debt since 2010 when the Fed was monetizing the bulk of the US deficit; this time around it's the opposite and starting this month, the US Central Bank increased the pace at which it shrinks its holdings of Treasury and federal agency bonds to $50 billion a month, adding to supply pressures. 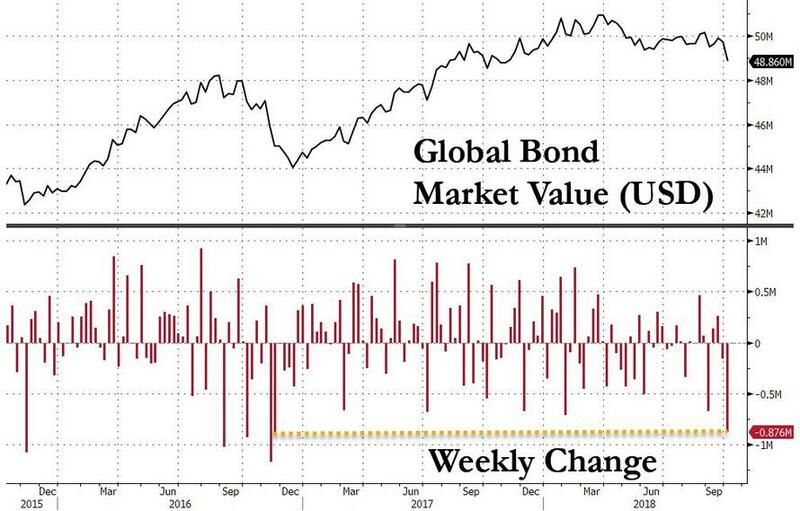 The bottom line: now that the bond vigilantes appear to have woken up from the decade-long slumber, a pernicious positive feedback loop has emerged, one where higher rates lead to more focus on the surge in underlying debt, which in turn brings more attention to rising interest rates, which spooks buyers who demand even higher interest rates as the cycle restarts. Where and when does it end? Instead of answering, below we show the CBO's latest baseline case (the pessimistic one is far worse). It is self-explanatory.